Spring is here and the days are getting longer and warming up, which means it’s time to get back into your Adelaide outdoor living room. It’s also a great time to add style to your outdoor area, so that’s it’s more inviting, comfortable and practical. Gone are the days when outdoor furniture was boring and uncomfortable. A good idea can be to look at your furniture inside and carry the style to the outside. Today, this is very possible, with a wide range of styles in outdoor furniture to choose from. Just as painting the inside of your house can make a big difference, so too can adding a splash of paint to the outside. 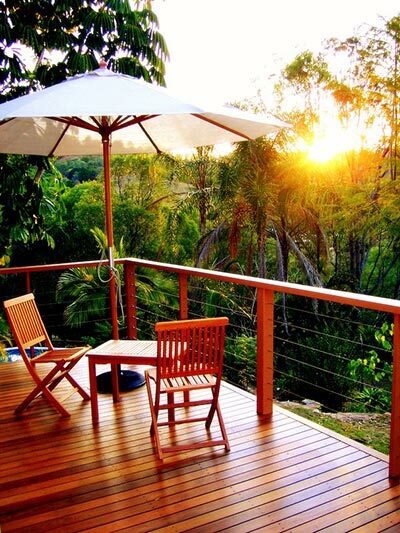 Painting a drab timber fence, for example, can really lift an Adelaide outdoor living room. Another way to add colour is in your outdoor furniture cushions, umbrella, table cloth and table decorations. An outdoor heater is a winner for comfort and it can also help make your outdoor living area more inviting, if you’re willing to steer away from the standard upright gas heaters. Today, there are a wide variety of heaters, such as ethanol burners and braziers, which add charm as well as warmth. Add some pots in colours that complement your garden furniture, paint and garden. An ornate sculpture, wall art, large clock or water feature can provide a focal point for your outdoor living area. A water feature will provide the added bonus of running water, which is calming and inviting. Include outdoor lighting in your outdoor living area and garden. At night you can create wonderful mood lighting, using relatively inexpensive DIY lighting. If you’ve got the space, add a colourful hammock to your outdoor living area. When you’ve got the hammock erected don’t forget to try it out… You’ve earned it!